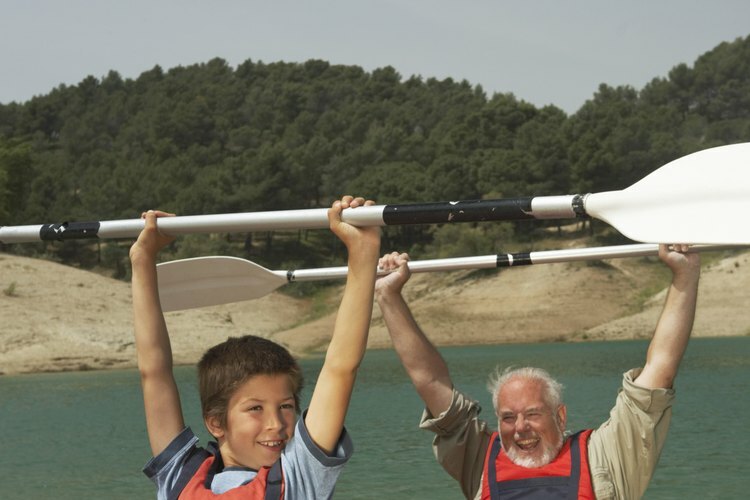 Helping each other meet a physical goal -- such as completing a canoe trip -- is an excellent challenge for family and friends. There's never a bad time for incorporating physical games and challenges into activities. From ropes challenge courses to games like bag bite, physical challenges are great for team building in the workplace, entertaining party guests of all ages and inspiring kids to stay active in their everyday lives. Physical challenges during parties are usually fun, simple and suitable for all ages. One example is bag bite, in which participants stand on one foot and try to pick up a paper bag placed on the ground using only their teeth. Many of the games traditionally played at picnics, including the egg toss, three-legged race and potato sack race, make great physical challenges too. Ropes courses -- sometimes simply called challenge courses -- are a classic workplace team builder. Under the guidance of trained facilitators, participants rappel, climb cargo nets, balance on swinging logs, help each other over walls and even ride zip lines. But that's not the only sort of challenge you can hold on the job: Weight-loss competitions and corporate programs that reward employees for staying physically active are both popular challenges in the workplace. Another popular activity is forming corporate teams for footraces, such as 5Ks and marathons. Gather friends and family together, and challenge them to a friendly day of challenge in your favorite sports. Good examples include soccer, touch football, canoe races, softball, Frisbee or kickball. Helping each other toward a mutual challenge goal can be equally satisfying; for example, hiking a challenging trail or building the skills to take an overnight kayak trip. Low-pressure physical challenges are an especially effective way of encouraging healthy habits in children, because they're pure fun and everybody wins by participating. Some examples include river jump, using jump-ropes to "draw" rivers that players must jump across; human knot, in which participants tangle their hands together, then have to "untie" the knot without letting go; and racing to fill buckets with holes drilled in them. Not all exercisers are motivated by hitting a personal best on the bench press or running a six-minute mile. However, there are a range of other challenges they can aim to overcome, including doing a one-legged squat, learning how to do a handstand or balancing on a teeterboard. Ultimately, the point of physical challenges -- for any age or interest group -- is to keep participants engaged, entertained and physically active. When that happens, everybody wins.